By 1867 Robert Dehnert, a prominent local brickmaker and landowner, had erected the present Brickmakers Arms on the Flockhart Street corner, retaining the name of the earlier hotel a few doors to the east, which derived from the Collingwood brickmaking industry based around Flockhart Street. Members of the Dehnert family were associated with the hotel into the twentieth century, and many of the other licensees also had names of German origin. In 1923 the name was changed to the Terminus, reflecting the location of the hotel near the end of the Victoria street cable tram route which terminated at Victoria Bridge. The building was later remodelled in the Moderne style. It displays typical features of the style such as steel-framed windows, curved corner, and horizontal facade treatment, the ground floor dado being tiled with distinctive bands of cream, green, and black tiles. 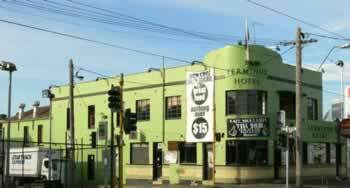 The Terminus was used as the location for the watering hole of undercover cop Peter Church in the TV program Stingers.